Hi everyone! Thanks for coming by. I'm really excited to share with you an awesome blog hop today where you can win 2 sets of Spectrum Noir markers! Just a bit of introduction for this blog hop. Every last Friday of the month, the Lawnscaping Facebook Inspiration Team will host a blog hop inspired by colours and sponsored by Spectrum Noir. Spectrum Noir are awesome alcohol markers that come in 168 colours. 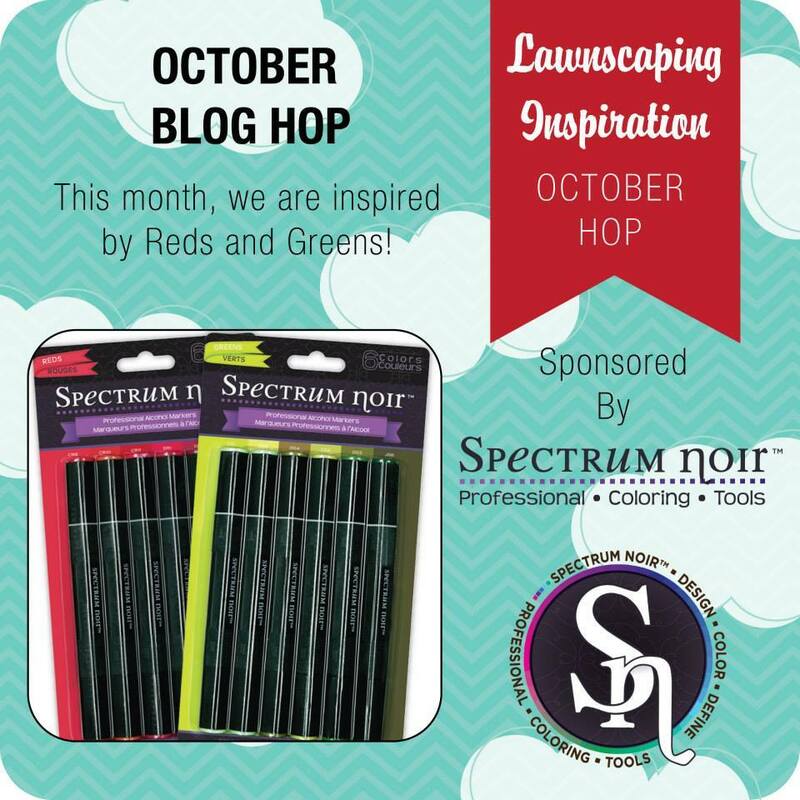 So, if you're a big Lawn Fawn fan like I am, you'll defintaley want to join this hop because you'll want to use those Spectrum Noir to colour your Lawn Fawn images :D This month we are inspired by the colours Red & Green. I have to warn you though, I felt like this isn't my best card and I'm sorry! My wedding is on the 27th Dec and it's just been crazy. But next, I will make it up to you with my next Lawnscaping post. In the meantime, I hope you still like my card. For this card, I wanted to show you that, even if you don't have a coloured paper, you can use your markers to make a coloured banner to match your card like I did here for my sentiment. The winner will be chosen at random from the comments from any of the hopper's blogs so be sure to comment on everyones posts and be inspired :) You will have until midnight Sunday EST to comment to be eligible for the prize pack. Beautiful creation. Love the sort of non-traditional color scheme for the occasion. I adore all the GOLD...it's a fantastic card. Congrats on your upcoming wedding...how exciting!!! Love the gingerbread people! Such a cute card! Great gingerbread family! Love them! Cute Ginger Bread card w/ sparkle. Beautiful! Love the gold frame! How adorable!! Loooove that golden frame and those little gingerbread men!! What a sweet card! Love the ginger bread man family! Such a cute card! I love the cute little gingerbread family! This card is sweet! So cute! Love those super cute gingerbread men! Darling card! this is really cute!! congrats on getting married soon!!! What a sweet, lil' card! Love the gingerbread men, makes me want to have cookies! What a SWEET card. LOVE it. Thanks for sharing. your card was my favorite of all hop!!! is so beautiful! That's so cute! Love it's a shaker card! adorable, love the gingerbread, great idea using the markers to make the contrast! What a beautifully sparkly card, with lots of gold and decorative sequins. I love this one!